KnitLit came up with a great end of the year / beginning of the year meme, Best of 2007 (that’s her logo below in the first square). These photos are not the best of my finished objects in 2007, they’re ALL of my finished objects in 2007. Apparently, I am a very slow knitter and someone who only knits accessories. From left to right, top to bottom, they are: 1. KnitLit’s logo 2. Queens Center Mall Socks 3. Ugly/Spring socks 4. Trekking socks 5. Chevron gauntlets 6. Odessa hat for Adam 7. Hat/scarf for my sister 8. Dairy Queen hat. The yarn for my Queens Center Mall Socks and Trekking socks were both gifts (from Adam and my former co-worker, respectively), so I am excluding their cost, but otherwise, the yarn cost for these projects was $64.50. I know I bought needles, stash yarn (and extra yarn that wasn’t used for some of these projects, like that hat/scarf thing), gadgets (including a swift! ), and books and magazines, but that seems to be fairly reasonable. I know the gadgets and stuff add up, but I feel safe that I have not yet turned into an insane hoarder. Must. Knit. Stash. I would have to go with the gauntlets. I wear them all the time, they are stylish, they are my own pattern, and they are fun to knit. I would say Another Shopgirl’s Phildar Vest. It’s very chic! I don’t know if they’re new, but I like the “little sister” versions of Interweave Knitting and Vogue Knitting, knitscene and knit.1. I think they have cuter, younger patterns. They’re kind of the Teen Vogue of the knitting magazine world. This is going to sound pretty basic, but realizing that a combination of increases and decreases, strategically placed could either make a spiral (Odessa hat and Dairy Queen hat) or chevrons (Queens Mall socks and chevron gauntlets). It’s one of those things you might read and understand, but until you see it in action, you don’t quite get it. (i) Other knitters, many of whom I’ve discovered through the Crazy for Knitting group on Flickr or on Ravelry. I’m always clicking the “favorite” button! (ii) The Satorialist. Everyone’s favorite fashion blogger. (iii) Anna Wintour’s Vogue. Even though it’s as mainstream as it can be (and let’s face it, kind of ridiculous in a let’s-pose-a-white-model-in-front-of-the-natives way), I still think Anna Wintour is the last word on American Fashion, with a capital F.
(iv) New Yorkers! Especially people on the subway. Sometimes, it’s just a color combination or an unusual texture, but I think between the locals and the tourists, there are so many great inspirations in NYC. Also, though I rarely venture there, I have to bow before the hipster girls in Williamsburg. I know they’re a walking cliche, but I still admire their outfits every time I drink in their land, and their style puts any non-Billyburg girl to shame. (v) New Yorkers, part II! In addition to being an inspiration, the fact that there are so many great dressers in the city makes you have to ante up your game if you want to stand out. Too often, I embrace my outer borough frump style, but it’s nice to have a whole city to compete with, if you want to dress up. I lived in a little town in China for a year, and I was far and away the best-dressed person there, because everyone wore pajamas and flip flops All The Time. Including outside. (It was like living in a college library.) The fact that I put on my regular pants to leave my apartment meant that I was more Dressed, not to mention better dressed, than a good 75% of the people in the town. It was kind of nice being the star in my town, but I have to give New York props for raising the bar. (v) Uh, Gossip Girl? I don’t know about this one, but I just watched an episode, and I have to say it packed more about class and money into one evening’s plot than all of Atonement, which I also just finished. Ian McEwan, seriously, watch some WB. Anyway, I like the ridiculous UES high-school tart style they have going on in this show. Fashion-wise, Prada, now and forever. Knitting-wise? I like this one Vogue Knitting designer who I never see mentioned on blogs: Vladimir Teriokhin. I haven’t made anything by him, but he has a sort of old-lady tailored UES thing going on with all of his designs that I always am drawn to. He always seems to be designing fierce capes. I really like what Knitsane does on her blog, where she talks about the different connotations of fashion. I actually majored in history, with a focus on consumer culture (aka SHOPPING) in college, so I really should have more to say on this topic. (I once took a class called “The Semiotics of Bourgeois Fashion” and actually learned a lot from it, despite the easily mocked name.) I’m not sure I have the time to write thoughtful consumer culture critiques every week, or in fact ever. Because I have to watch Gossip Girl. Duh. But something to strive for. 1. The never-ending Ella shawl 2. The Hot Pink Mittens 3. A new traveling sock (“The traveling sock is finished!” “Long live the traveling sock!”) 4. My friend Kim’s hat which I finished in 2006, but which she claims fits her like a yarmulke, and which I promised to lengthen, but never did…Kim! I will lengthen it! I promise! Posted in Finished Objects 2007, Links, Uncategorized at January 3rd, 2008. Posted in Finished Objects 2007, Socks, Uncategorized at December 16th, 2007. Posted in Finished Objects 2007, Gloves, Hats, Uncategorized at December 6th, 2007. Look, Adam finished his first knitted object: a roll-brim hat! Maybe I need to stop complaining and keep knitting to have an F(inished) O(bject) of my own. Posted in Finished Objects 2007, Uncategorized at November 25th, 2007. Yarn: 1 ball of Sockotta, 5% cotton/40% wool/15% nylon, $9 from The Homespun Boutique, in Ithaca. Not much to report–the yarn is kind of stringy, and the pattern rather ugly, but I actually really enjoyed knitting the self-striping pattern. 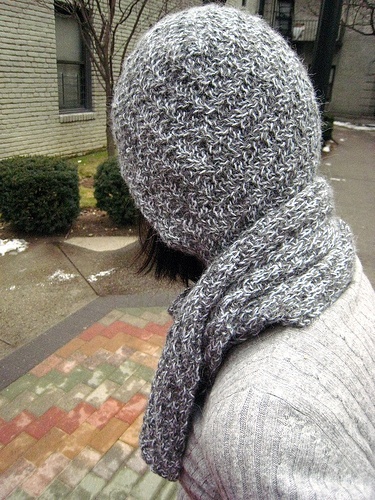 I would definitely knit a self-patterning yarn again, though I do think the result is weird. Ugly socks meet ugly shoes. My inner San Franciscan comes out. Ugly socks without the shoes. It only took me half a year to knit these socks! Here’s a flashback montage of the sock over the seasons. Posted in Finished Objects 2007, Socks, Uncategorized at September 9th, 2007. Posted in Finished Objects 2007, Gloves, Mittens, Uncategorized at March 17th, 2007.